"You can be successful but not significant, but you cannot be significant without being successful." - Darren Hardy, editor of SUCCESS magazine. Consider society's definition of success. Who do we "look up" to? Is it really significant that so and so wore that dress to the grammy's or so and so is getting married or so and so just bought a 12.5 million dollar house? How do you define success for yourself? Are you heading in the right direction? The one that will fulfill you? Adam LoDolce spoke at our college this week and I just wanted to tell EVERYONE to go hire him as a speaker for your college - especially community college. Adam teaches students how to step outside your comfort zones, how to attract more people to you, and how to really be yourself without the fear of rejection. And he does this in a relatable, interactive, and very funny way. This is so valuable to community colleges as we often have to work extra hard to try to get students involved on campus and step outside their comfort zones to try new things (since they don't live on campus). Get Adam to make your next event one that is enlightening, really fun, interactive, and that encourages more of your student body to get involved. I was so impressed. 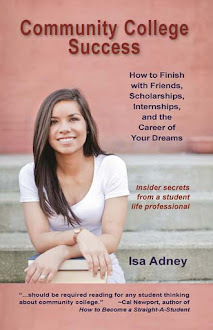 First off - go to your college's career center today! And also check out this awesome job projections site from the US Dept. of Labor. It lists hundreds of job titles and tells you exactly what that job does, what the projected salaries are going to be, and how the job is projected to be affected in the next 7 years. If you're like me who knew nothing of what kinds of jobs were out there besides teacher, doctor, lawyer - then browse this site. You just might find something that interests you that you've never thought of before. 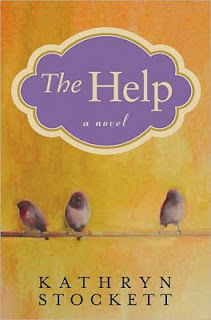 I just finished reading the book The Help and loved it so much. I had seen the yellow cover with the purple birds for a while now, but didn't give it much thought. A friend said it was good last week and then boom I bought it and read it and LOVED it (can't wait to see the movie now too). With all the marketing in the world it's funny that what seems to still always work is friend to friend recommendations - word of mouth. Share the stuff you love because while you think everyone may know - you'd be surprised. Share your expertise, your solutions, your favorite things. People will appreciate it.